Revolights, "The best bike lighting system in the world" according to Men's Journal, is now better now better than ever before. Eclipse now integrates the rechargeable battery directly in the rings themselves, thereby making the on/off switch more accessible and removing any need for cables and parts on the spokes or in the hub. Legal Headlight: Revolights' intelligent LED rings mount to your spokes and are spaced apart so as to project light past your tire, illuminating the path in front of you and creating a legal headlight. Unlike traditional spotlight style headlights, our patented design creates a "blade" of light, lighting up the ground as well as elevated objects light street signs. Each wheel consists of 24 equally spaced bright LEDs, with 8 on at any given moment. Smart Taillight and Brake Light: By constantly tracking your wheel speed, Revolights is able to detect when you hit the brakes and alert traffic with a first of it's kind brake light. Once a change in speed is sensed the red will flash at a rapid rate informing tailing traffic that you are decreasing speed. 360° Visibility: By mounting the headlight and taillight to the wheels Revolights are able to create bright visual "arcs" of lights, making you stand out with unmatched 360º visibility. Similar to automobile standards Revolights creates a visual boundary of the bicycle that can be seen from any angle as well as a visual cue for traffic to define direction of travel. USB-Rechargeable Battery: Eclipse is powered by two Lithium-Ion batteries. They are micro-USB rechargeable and last 4 hours. Before purchase, please ensure your bike is Revolights compatible using the provided fit chart or by emailing fit@revolights.com. 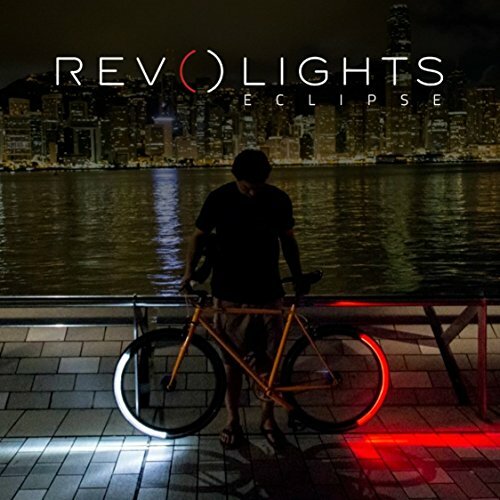 If you have any questions about this product by Revolights, contact us by completing and submitting the form below. If you are looking for a specif part number, please include it with your message.